When I was growing up, Radio was Everything. It was how you heard the best new music and songs you loved. It was diverse...you might hear Led Zeppelin followed by Johnny Cash. The DJs were distinct personalities that knew a lot about the music they were choosing to play. They told you interesting things and were spontaneous,fun and had no need to get raunchy or suggestive...it was about the MUSIC! Today, the corporate mentality has taken over what was once a great institution and turned it into a vast, stale wasteland of repetition and mediocrity. The corporatization of radio has taken all the creativity and musicianship away, settling now for "voice talent" that reads jokes and stories purchased from "content providers" and know little or nothing about the music that is playing around their voice breaks. The music is chosen by test groups and/or by the financial rewards the company will reap by playing it. Our mission is to bring back radio the way it should be. With live DJs who know what they're playing and talking about, with a wildly diverse mix of quality music that comes from the heart. A huge catalog going deep into the classics, with music from an amazing array of artists that terrestrial radio has ignored for the last 20 years, as well as great songs by artists from 30 or 40 years ago that you simply NEVER hear on the radio, and that includes satellite. You'll hear great music by your favorite artists and we'll turn you on to lots of GREAT artists you might never have heard otherwise. We will tirelessly search for the best music whether it be national, regional or local in its origin, and regardless of style, genre, or what "format" it fits under. 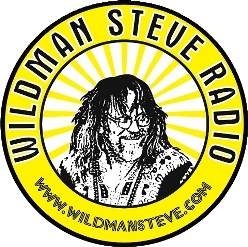 We will present to you LIVE IN-STUDIO PERFORMANCES on a regular basis from artists we play, and if you become a Member of the WildmanSteve Radio family, you will have access to our Members-Only Download Page which will feature exclusive live performances you can download and keep. We'll bring you great radio the way it was meant to be. We mean it when we say "IT'S ALL ABOUT THE MUSIC!!"